Mazda is issuing a stop-sale and stop-delivery for its popular Mazda3 compact because of a defect in the fuel shut-off valve. Cars built from May 21 to Aug. 24 are affected. In total, 14,720 vehicles in the U.S. and 136 in Puerto Rico need fixes. 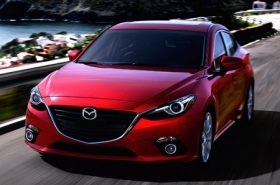 Mazda says the faulty valve could allow fuel to flow from the fuel tank into the emissions charcoal canister. If the fuel exceeds the capacity of the canister, it could leak, possibly causing a fire. It’ll also set off the “check engine” light. Mazda will contact owners by mail in October. They’ll be instructed to bring their vehicles to the nearest dealership as soon as possible, where technicians will inspect the tank and canister. If a fault is found, they’ll replace it at no cost. A rental car will also be provided. There have been no reports of injury, according to Mazda, but it is offering customers a ride to the dealership if they don’t want to drive.